Our third child was delivered on Saturday January 12 at about 12:30 pm. Yuda Jackson was 39 1/2 inches and he weighed 30 pounds. Within the hour, Tammie was outside playing basketball, with Yuda. Yuda is 5 years old, and we have been trying for about 4 months to complete the paperwork for foster care. After 3 months of foster care, we can apply for adoption. Yuda's mom died when he was about 1 week old, and his father took him to an orphanage about 2 hours away from where we live. Even though his father promised he would come back and pay the entrance and monthly fees, he never even visited him. Usually at this orphanage, when children reach the age of 2, a family member comes and takes them home. 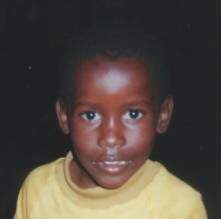 But Yuda was still at the orphanage at the age of 4 years and 9 months, and nobody from his family would take him home. So we welcomed him into ours. Since he was too old for the orphanage, he was transferred to a street kids ministry, but the kids there were all 7 and older, so he was really too young to stay there. While we were waiting on the foster care paperwork to be processed, Yuda stayed with the family of the director of the street kids ministry. It was a good period of transition from institutional care into a real family, especially since they all speak Swahili. We had visited Yuda several times, and he even came to our house to play with Morrie a few months ago, so he was comfortable coming to live with us. The first few days have gone extremely well, as smoothly as we could have hoped for. We were hoping Yuda would be with us for Christmas, but we left all the Christmas decorations up so we could celebrate together after he arrived. We had a welcome party Saturday night and opened gifts. He was a little uncomfortable going into the school yard Monday morning for the first time, but he will adjust. It is an English medium school, but none of the kids in the preschool level speak English as their first language. He will be learning along with his classmates. Bradley and Morrie are finally showing some signs of trying to learn Swahili as they play with Yuda. We now do bedtime Bible stories and prayers in 2 languages. I know God hears our prayers the first time in either language, but we just want all the kids to hear what we are praying about. Some of you have been praying a long time for Yuda, and we are thankful that he is finally with us. I wonder what is going through his mind as he takes in his new surroundings and new family. Does he even know what family is? I just hope he feels loved and secure. Thank you for your prayers, and we thank God for giving us another child to care for and love.